Remove all but about 2 tablespoons of fat, reserving excess, and add the chopped onions and garlic; cooking slowly until caramelized. Add the cumin and coriander, stirring to coat the onions and garlic. Add the meat in batches and brown, then transfer browned meat to a slow cooker. Remove excess fat from dutch oven, and deglaze the pot by adding the beef stock, scraping up the bits from the bottom of the pan, then pouring the stock into the slow cooker. Add chipotle peppers and adobo sauce, diced tomatoes and salt to the slow cooker. Stir in the masa harina. Cover allow to cook for approximately 4-6 hours on high or 6-8 hours on low. Serve as is or over your favorite short pasta (macaroni or shells). 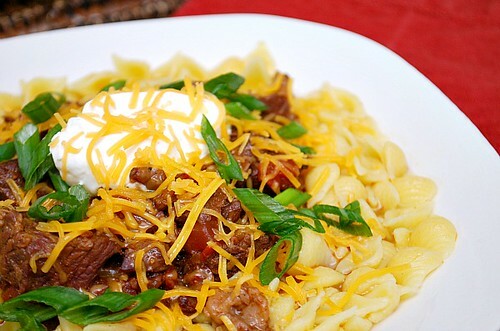 Chili con carne is essentially a stew with many spices. It is prepared with onions, cumin, peppers, garlic, and types of meat – which can include ground or sliced beef, and sometimes white meats. It can also include other vegetables, such as tomatoes. Beans are common for this dish. Most people simply know it as chili. There is some dispute over which ingredients should be involved, such as the inclusion of beans. 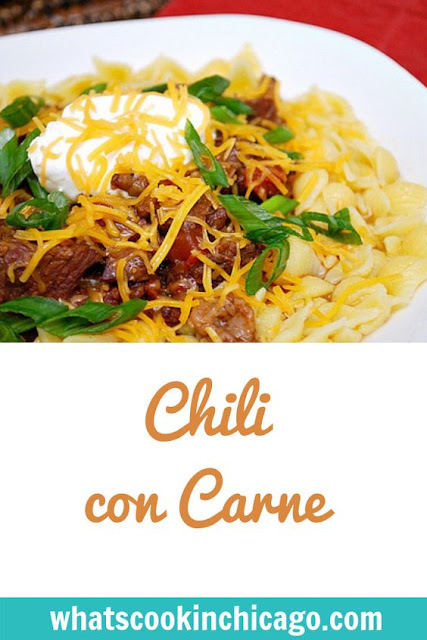 The same applies to whether or not chili con carne can stand on its own as a dish, since in Mexican traditional food preparation, it is only used as an ingredient.